Make well informed business decisions with ease! Would you like to transform your fragmented business data into easy to understand information that allows you to make timely business decisions? Are you having a difficult time pulling together all your data into a single, clear picture outlining your business operations? Would you like a common set of KPI’s and metrics based on your ERP data? Would you like automatically generated reports within the organization based on a defined predetermined schedule? Would you like to be able to facilitate collaboration between business functions such as sales, purchasing, manufacturing and logistics? Sage Enterprise Intelligence fully integrates with Sage 300 ERP and provides business users real-time and reliable information to make faster and better business decisions across the enterprise. 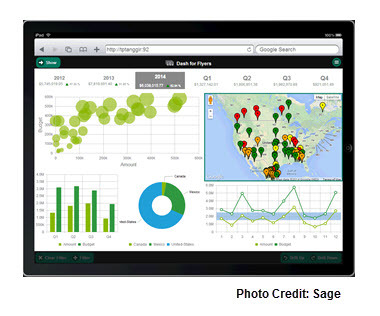 Note: Sage Enterprise Intelligence is compatible with Sage 300 ERP Version 2014 and beyond. Give your business users the power to analyze and create reports on their own—with no special expertise required. Sage Enterprise Intelligence is easy to use and offers an intuitive web interface and access through mobile devices. You can also leverage existing skills on your team and work with the power of Excel to report on your Sage ERP data. For more information on Sage Enterprise Intelligence do not hesitate to call us at 866-435-0243.